"A friend of mine sent this recipe to me when I got my first apartment, because she knows how much I hate cooking! It's really easy -- even I can make it -- and tastes great. I'm not sure where she found the recipe, but it included the note 'Good source of protein, vitamin A, B group vitamins, calcium.'" Preheat the oven to 350 degrees F (175 degrees C). Lightly grease a 2-quart baking dish. In a large pot of salted water, lightly boil the macaroni for about 5 minutes until half-cooked. Whisk the egg and milk together in a large cup. Add butter and cheese to the egg and milk. Stir well. 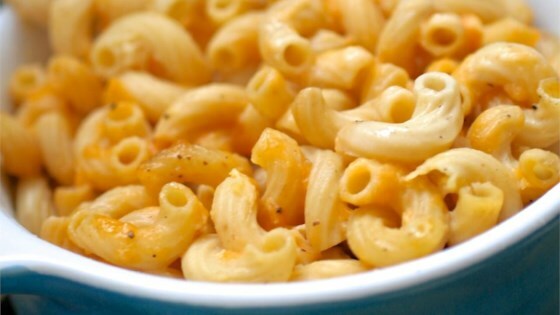 Place the lightly cooked macaroni in the prepared baking dish. Pour the egg and cheese liquid over the macaroni, sprinkle with salt and pepper, and stir well. Press the mixture evenly around the baking dish. Bake uncovered, for 30 to 40 minutes, or until the top is brown. The people I served it too absolutly loved it!! I thought it was way to "watery". I would cut back on the milk.